Every now and again, you get these little pseudo-artsy, quasi-indie films that think they are so clever but only end up showing you that you can have high aspirations but fail so badly in execution. Rachel Getting Married is such a film. If it were not for Anne Hathaway's performance, the film would be completely unbearable. With her performance, it becomes merely tolerable. Kym (Hathaway) is being released from rehab over the weekend to attend her sister Rachel's wedding (Rosemarie DeWitt). In the course of three agonizing days, we not only see the bitterness and self-loathing Kym has, but see her have a fling with the Best Man/fellow AA member Kieran (Mather Zickel), whine her way into being the Maid of Honor which she'd always assume she'd be, and drive her whole family into both concern and frustration: her father and stepmother (Bill Irwin and Anna Deavere Smith), and her mother (Debra Winger). We also must go through the sheer boredom of the most pseudo-hip wedding full of appropriately multicultural guests and trappings, various ghosts from the past that have brought the family to the state they are in, and at the end of her weekend, a semblance of acceptance by Kym for Kym. Let me start by saying that the wedding itself had the bride and bridesmaids wearing saris. I figure this is writer Jenny Lumet's way of trying to make the family a hip, progressive one. For my part, I think the only people who should be married in saris are those of Indian descent, not faux-hippies. However, truth be told the sari situation (pun intended) is the least of Rachel Getting Married's problems (which is saying a lot). As a side note, Rachel Getting Married was before the phrase 'cultural appropriation' became the rage, which means that this same family who thinks the saris are a good idea would get ripped for using them, but I digress. Throughout the movie I kept getting the sense that both Lumet and director Jonathan Demme were trying oh so very hard to make Rachel Getting Married some sort of quasi-independent film with shooting the film in single camera and having it move around as if it were a home movie or documentary. The problem with that is that we know it's not a documentary or home movie: certainly when we see Kym crash. That penchant filmmakers have to have a shaky-camera motif drives me endlessly crazy. Moving the camera all around not only creates a sense of nausea but becomes hopelessly distracting and irritating. Another issue I had with Rachel Getting Married was that the entire plot and the situations within it appeared remarkably manipulative. At one point I believe Kym comments how something appears to be a "total set-up", but that could easily be applied to the movie itself: one long pseudo-artsy set-up. In fact, let's go over that particular scene in question. After a very lengthy rehearsal dinner and I mean lengthy: it played more like Amateur Night on The Gong Show than any rehearsal dinner I or anyone I know has attended or been in, Rachel is furious that Kym's toast appeared to be more about her than about the bride-to-be. The sisters have a massive fight, the dad just frets, the stepmom shows her concern/disapproval but doesn't really speak, the groom-to-be stays mostly silent. Then, just as the fight reaches some sort of crescendo, Rachel announces she's pregnant. The dad does a literal jump for glee (complete with clapping his hands like a trained seal), but poor Kym is upset, apparently that the fight can't go on because now everyone is paying attention to Rachel rather than her. Kym's response? "That is so unfair!" It all seems too cute, too pat, too scripted to come off as authentic. Rachel Getting Married never comes across as realistic. It plays like something that is written as opposed to something that could actually happen. In almost all the film, I kept wondering why the script rarely allowed for moments of genuine family warmth or really anything that appeared to be an authentic or at least, non-elitist, family weekend. Yes, the entire family, Kym included, and their guests never appeared to be anything other than a bunch of hopelessly elitist, affluent, pretencious, artsy people. By the end of Rachel Getting Married, I really just wanted to get away from the wedding party. As a digression, I never shook off the sense that the entire wedding party, from groom to family to guests, were all cast to fill some PC quota; you had African-Americans, Asians, Arabs, Brazilian samba dancers, what appeared to be a folk band in the style of Nickle Creek, Fab 5 Freddy (I did wonder, he's still alive), jazz music, Arabic song, gospel music, stand-up comedy...and this was at the rehearsal dinner! Actually, the samba dancers were at the wedding dance, but really: Arabic songs at a non-Arab wedding? It's almost as if Demme, Lumet, and everyone involved in Rachel Getting Married wanted a rainbow coalition to be included. Nothing wrong with that per se, but when you have WASPS in saris getting married to then end with samba dancers after having had both jazz and Arabic music being performed, you have to ask yourself what world these people occupy. For the most part, I wasn't overwhelmed by the performances as directed by Demme. In particular dislike was Irwin: his Happy Happy Joy Joy Dance at learning he's going to be a grandpa kept me wondering if he was a comedian. Given that the groom, Sidney (Tunde Adebimpe) was almost irrelevant to the story, it would be fair to say that we never got an idea that he or Rachel were truly in love except that the script told them they were. Winger's role was small but pivotal to discovering the truth about why Kym has become notorious in both her circle and outside the rehab center. If the scene between Winger's Abby and Hathaway's Kym had been set up with more than one camera and been directed to be more calm, we could have had a truly heartbreaking scene of reconciliation and acceptance of loss. However, the confrontation between mother and daughter was so fast that it almost became difficult to follow exactly how it got to that state. Even worse, it descended into farce: I could understand a slap, but to see them exchanging punches? However, this isn't to say Rachel Getting Married doesn't have good things in them. Chief among them is Hathaway's brilliant performance as the brittle, self-destructive, narcissistic, yet damaged Kym. She is a loose cannon (at one point she's called a 'loose cannon', which I found interesting since I wrote that phrase in my notes shortly before that was said), but she is also someone that can easily be hurt, a woman haunted not just by her own addictions but what those addictions have caused her to do. When Hathaway acts with her face and eyes, she expresses both the brittleness and the vulnerability within Kym, saying so much with a glance or an expression. It is one of Anne Hathaway's best performances. There are a few moments in Rachel Getting Married where both the single-camera method and the story work. When she speaks at the AA meeting and learn more about her past mistakes, it is heartbreaking. When she returns to the house on the wedding day after her car accident, Rachel gives her a gentle bath in order to get her ready. It is a beautiful, quiet, tender scene, showing without saying anything the deep bond these two sisters have despite all the difficulties they've put each other through. However, I point out that these scenes, unfortunately being few and far between, were moments of realism, and of quiet, not where people were ranting and raging, stomping about left right and center. 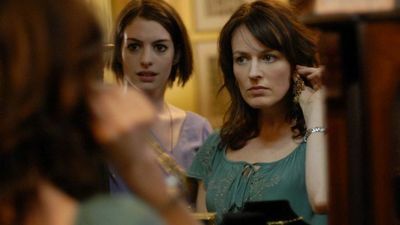 It is to my mind unfortunate that Anne Hathaway's brilliant performance in Rachel Getting Married is trapped within a manipulative story where the camera work became far too distracting and irritating to enjoy. In short, minus Hathaway, this was one lousy wedding.